South Korean President Moon Jae-in headed to New Zealand on Saturday, ending his three-day trip to Argentina for the annual Group of 20 summit, which also provided the venue for a possibly crucial meeting with US President Donald Trump. At the annual meeting of the leaders of the world's 20 largest economies, the South Korean president sought to promote free trade and joint efforts to tackle global issues, such as climate change and slowing economic growth. 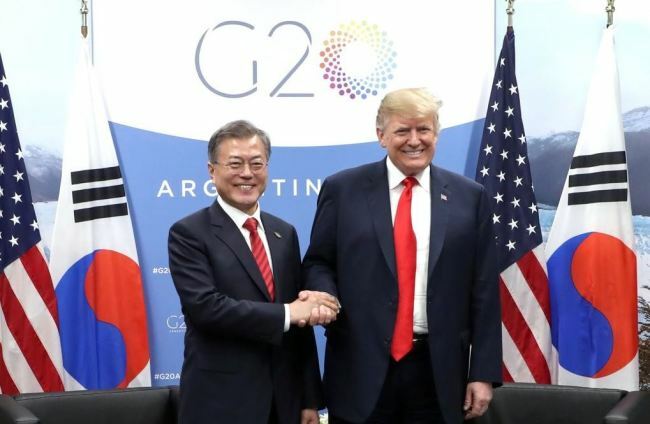 However, the highlight of his visit came Friday when he and Trump held their sixth bilateral summit since both leaders took office last year. Moon emphasized the need for both countries to continue engaging in dialogue with North Korea as a way of accelerating their joint efforts to rid the communist state of its nuclear weapons, apparently expressing his intention to invite North Korean leader Kim Jong-un to South Korea before the year's end as earlier agreed with Kim. Trump seemed to have offered his blessing for what would be a fourth Moon-Kim summit when he and Moon noted Kim's visit to Seoul may create fresh momentum for their denuclearization efforts, according to Moon's chief press secretary, Yoon Young-chan. The US president also reaffirmed his commitment to meet Kim early next year. Trump met Kim in June in what marked the first-ever US-North Korea summit. Moon's departure also followed a series of bilateral meetings with other global leaders, including Dutch Prime Minister Mark Rutte and South African President Cyril Ramaphosa. He also held the first South Korea-Argentina summit in 14 years with President Mauricio Macri earlier in the day. The South Korean president will arrive in Auckland on Sunday for a three-day state visit that will include a meeting with Governor-General Patsy Reddy.